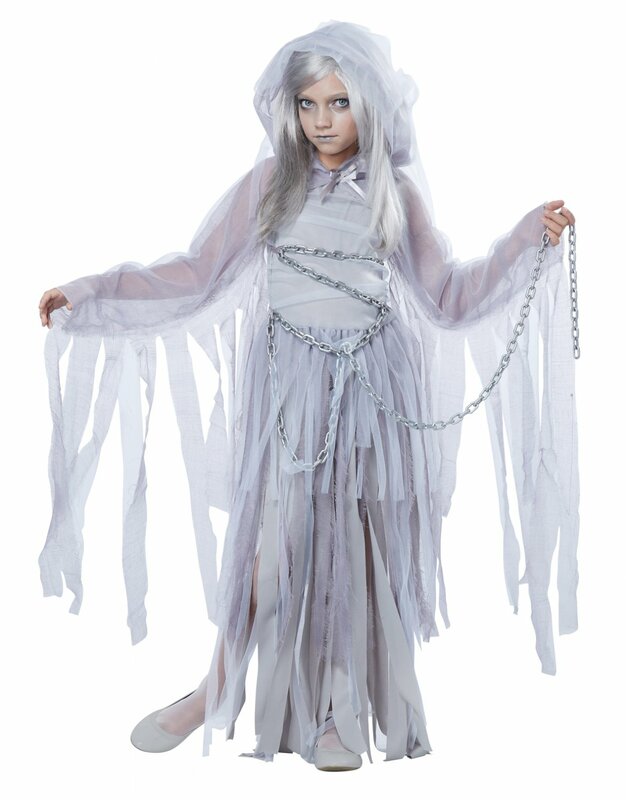 Transform your child into a sassy adorable Haunted Beauty Ghost this Halloween. shrug with attached hood and chains. X-Small (4-6): Chest - 25" Waist - 24" Hip - 26" Height - 46"
Small (6-8): Chest - 27" Waist - 24" Hip - 28" Height - 53"
Medium Plus (8-10): Chest - 32" Waist - 28" Hip - 33" Height - 55"
Large (10-12): Chest - 30” Waist – 26” Hip – 32” Height - 58"
Large Plus (10-12): Chest - 33" Waist - 29" Hip - 35" Height - 58"
X-Large (12-14): Chest 32” Waist – 27” Hip – 34” Height - 61"